Behind The Ear Hearing Aids - Get Information + FAQs Here! We’ve all seen the cartoon characterisation of an old gentleman with hearing loss carrying a horn. When he wanted to hear, he would raise the horn to his ear. A person wanting to communicate with the chap would come next to the horn and shout into it. Ear horns are still available on the market today, but fortunately hearing technology, in the form of hearing aids, have improved out of sight. Not that long ago, body aids were the norm. A big box that looked like a walkman and was hooked up to the patient’s ears, sat across the chest of hearing loss sufferers. Along came behind the ear hearing aids with their transistor technology and miniaturisation was borne. No longer did the hearing impaired need to wear an amplifier box around their necks with long chords. Instead a little receiver was placed in the ear and mounted across the top. While miniaturisation continues to drive the development of most electronic or technological advances, conventional hearing aids have now morphed into “Behind The Ear,” “In The Ear,” “In The Canal,” and “Deep Canal” devices. Unfortunately, smaller is not always better. 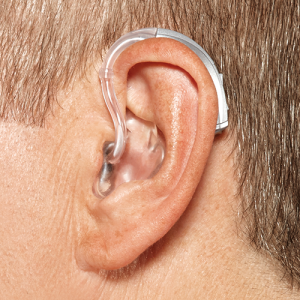 Think about a hearing aid as consisting of four basic components: a microphone, an amplifier, a mini-speaker (or receiver) and a coupler to connect the hearing device to the ear, also known as the ear mould. Every hearing aid will have these components and we outline each element below. Microphones are a tuneable variable and its components may vary from ceramic type to condenser type. The choice and size of microphone will determine its frequency sensitivity. The bigger the microphone, the wider its frequency sensitivity will be, while the smaller the microphone, the more narrow that frequency range will be. The choice of microphone may be part of a strategy for meeting the hearing needs related to a specific type of hearing loss. The microphone receives sound, converts it to an electric signal, and delivers it to the amplifier. Widely acknowledged as the workhorse of the hearing aid is the amplifier. It receives the auditory signal from microphone, magnifies it, and may alter that signal so that some components of the signal are damped and others amplified. Today’s hearing aids may alter the amplification process by pots, little potentiometers that are mechanical (little screws on the hearing aid) or electronic (digital switches that are computer-mediated). The hearing aid may have a physical volume control or a digital control similar to a tv remote, allowing the hearing aid user to change volume remotely. For users having physical mobility problems, the remote control volume manager may be especially useful. The amplifier sends the electrical signal to the hearing aid receiver. That electrical signal is directed to the little hearing aid speaker called a receiver. Just as microphones can be tuned, so it is with the receiver. As the size of the receiver grows larger, its ability to offer a fuller dynamic for amplified sound is enhanced. Typically, the receiver is one of the larger components in the hearing aid. The electrical signal from the amplifier causes the receiver to vibrate causing sound waves which are directed to the ear of the hearing aid user. The sound may be directed into the ear canal directly or via tubing and ear-mould. 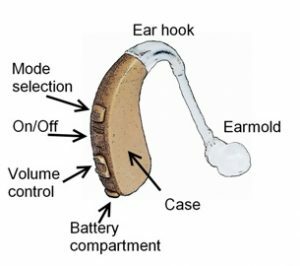 On one level, the earmould is a simple coupler that holds the hearing aid to the ear, but on another level, it is a device that allows modification of the sound coming from the receiver. The length of the tubing, its thickness, and its diameter affect the quality and frequency range of the sound coming from the receiver. The earmould may be custom-made and be fabricated from a variety of materials. Its material density will affect sound quality. Although today’s materials may set off allergies in some people, hypoallergenic plastics or coatings will address these problems. Earmoulds may be vented, allowing some of the sound entering the space between the earmould and the eardrum to escape, causing the sound to have a higher frequency emphasis quality and damping of the lower frequencies. 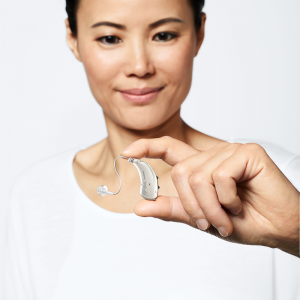 Behind the ear devices today offer the hearing impaired user the greatest flexibility of hearing aids available. Our discussion has revealed that there are four individual hearing aid components that may be modified to meet a user’s specific hearing needs, allowing the hearing aid vendor to adjust sound quality in many different ways. People often think that “smaller is better,” but there are limitations related to those pots we discussed earlier. There has to be sufficient space to permit their inclusion in the hearing aid product. For example, many of us want a volume control in our hearing aid, even when today’s technology allows a little computer circuit within the aid to adjust the hearing aid loudness by itself. But the major problem related to size is feedback. We know what happens when a stage microphone gets too close to a speaker when we go to a live performance. There’s an annoying shriek. Think about what is built into your hearing aid. The microphone is very close to the receiver, that mini-speaker. There is a finite limitation on how loud a hearing aid can get before that feedback occurs. The only way to mitigate feedback problems is to separate the microphone and the receiver. BTE hearing aids give us the distance we need to squelch the feedback. The result is that we can give hearing aid users much greater volume with a behind-the-ear instrument. More sound power means higher battery usage as well as feedback, but BTE aids allow use of larger and longer-lasting batteries. So Which Hearing Aid Is Right for You? Hearing aid models, earmoulds, manufacturers, and vendors number the hundreds, possibly thousands. The evolution of technology has given us a number of cosmetically acceptable alternatives. Today’s devices provide a good answer for many of the hearing impaired. We can get the volume we need, the sound quality we desire, and the battery life that is practical for us from manufacturers with established track records who work closely with local audiologists we trust. 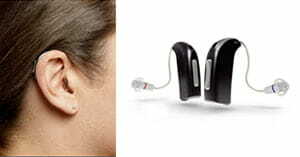 At Hearing Choices we feature information about a huge range of the latest hearing aids available on the market today. We have the globe’s top manufacturers covered. You won’t find better hearing aid information anywhere in Australia. What Are Behind The Ear Hearing Aids? They are used to cover the broadest and most general sorts of hearing loss. The Device sits behind the ear in a container and passes sound to the ear via a thin tube to an ear tip secured in the ear. 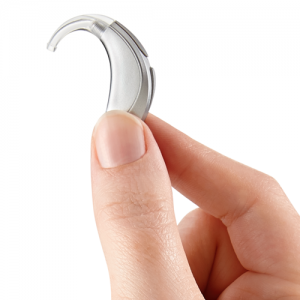 The tip of the hearing aids are carefully moulded to fit a person’s ear. BTE hearing aids are quite popular due to their strong amplification. Who Are BTE Hearing Aids Suited To? BTE hearing aids are suitable for people of all ages and are commonly used to counter hearing loss in children. Because the container for the behind the ear hearing aids sit outside the ears, they can use larger batteries and therefore have longer lifespans before needing to replace the batteries. Another advantage of the BTE aids is that they are usually easier to repair as they sit outside the ear, and are also easy to connect to other sources then other types of hearing aids. Many BTE aids are also Bluetooth enabled meaning you can easily connect them to your phone or other Bluetooth devices. How Many Types of BTE Aids Are There? These have high sound quality as the speaker for the hearing aid is built into the mould that is placed in the ear. The microphone and the processor are still situated in the case behind the ear with a thin tube connecting them to the speaker in the ear. These are the more modern style of hearing aids and while originally used specifically for high frequency hearing loss, are now commonly used for a more broad range. The mini BTE hearing aid, or slime tube hearing aid is a small container that sits behind the ear and is connected in the ear with a very thin tube. The tip does not completely seal the ear and therefore provides for a more natural feel. This hearing aid was commonly prescribed for high frequency hearing loss but now can be used to alleviate broader range of frequencies. The BTE with ear mould hearing aid are larger devices housed behind the ears connected to a thin tube to a custom mould in the ear. They are larger and therefore normally have larger batteries and more features than other styles of BTE hearing aids. These behind the ear hearing devices are common with children as they are easily reprogrammed and the moulds redone as they grow.